What is the Term Browser? The Term Browser is a companion to the Acrolinx Terminology Manager. It serves as a reference tool for anyone in your organization who needs quick access to information in the terminology database. 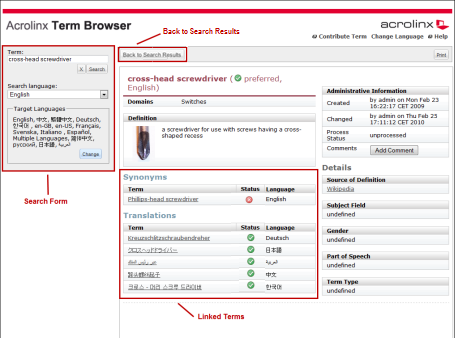 Search for a term using the same search tools that come with the Acrolinx Terminology Manager. Access a term help page which displays reference information about the term. Share links to term information with other users in your organization. Standard view - This view provides the same search and filter tools that are visible in the Acrolinx Terminology Manager. The standard view is suitable for users who are comfortable with filtering for terms on a wide range of filter criteria. 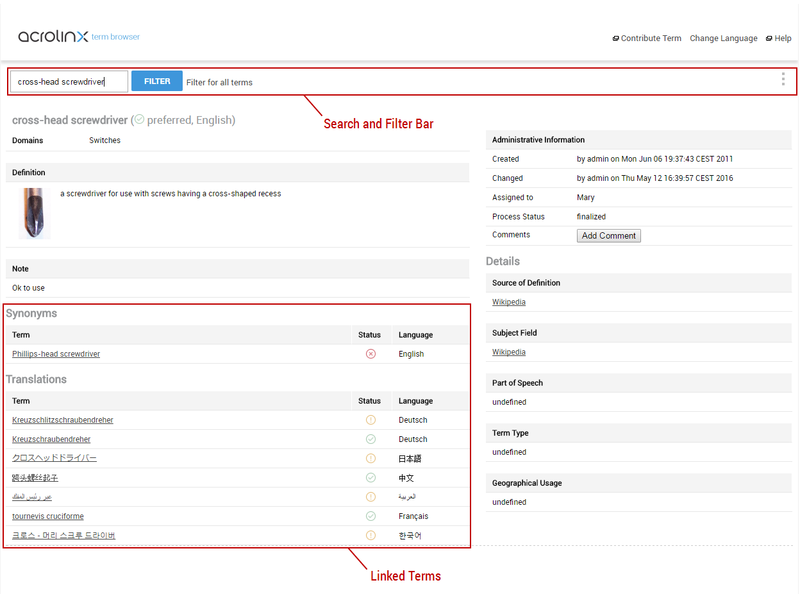 Translation view - This view provides a simplified set of search tools intended for users who need to quickly locate translations and do not need to use the full set of filter criteria. Tip: ​<​S​E​R​V​E​R​_​A​D​D​R​E​S​S​> is the IP address or host name of your Acrolinx Server. Ask your Acrolinx Server Administrator if you are unsure of the server address. Click the Change Language menu item in the top right of the Term Browser window. Select your desired language from the dropdown. The Search Field always appears in the left side of the Search and Filter Bar and enables you to search within the terms defined by the filter criteria. If the default filter is "Filter for all terms", the Search Field searches the entire terminology database. The Search Field is an Autocomplete Field which anticipates your input. Using the first few characters that you enter, the Search Field searches the terms within the filter criteria and displays a list of possible matches in the Autocomplete Dropdown. Enter your search text in the Search Field . Tip: All characters are treated as wildcard searches by default. For example, if you enter the character "a", words containing "a" are listed in the autocomplete dropdown. Click on a term name to display help information for the term. Click on the Match Pattern option to display a list of terms which match your search pattern. Tip: To clear the search box, press the ESC key. To force the autocomplete dropdown to appear, press the down arrow on your keyboard. While the term search generally works very intuitive, it might be important to know about some of the fundamental concepts. When you start searching for a term, all characters are treated as wildcard searches by default. For example, if you start typing and enter the character " a" , the autocomplete dropdown lists words containing "a". If you continue typing and tighten the search term to "ac", the autocomplete dropdown lists words containing "ac". When your terms contain quotation marks, you must escape these characters. This is necessary because the search works similar to a standard search in any search engine. Entering quotation marks does not search for the quotation marks, but marks a search query as a search for an exact word or phrase. For example, the database might contain the term Database "Topspin Documents" . If you search for the exact spelling of the term, the search won't find the term. Instead, you must escape the quotation marks and use the following search query with escaped characters: Database \"Topspin Documents\"
When you search for terms in the Terminology Manager or the Term Browser, the results appear in the search results table. Acrolinx uses an infinite scrolling list instead of pagination to display long lists of terms. The page automatically loads more items when you get close to the bottom of the page. To aid navigation, the table header is always displayed on top of the page when you scroll down. Infinite scrolling makes it easier to work with long lists which are common when working with terminology. 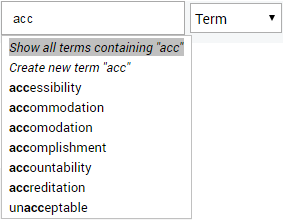 You can group terms by term entry to see all terms that belong together. If you click Group by term entry , Acrolinx groups all synonyms and translations and displays them in separate sections of the search results table. This feature is especially useful if your terms usually have many synonyms and translations. You can use the term help page to get basic information about a term. Your Acrolinx Terminology Manager can fully customize the layout and information in the term help page to meet the requirements of your organization. For example, your administrator can adjust the term help template to add fields, images, and company branding. The Acrolinx Term Browser displays different search tools with the term help page depending in whether you are in the standard view or the translation view . In the standard view , your most recently used filter is still visible in the search and filter bar above the term help file. In the translation view , the search form is displayed on the left-hand side, and you can click Back to Search Results to go back to your most recently used filter. The default template for the term help page contains a linked terms table with links to other terms within the term entry. Click the links in the linked terms table to open term help files for related terms. You can show or hide terms in the linked terms table by using the Linked Terms button in the standard view , and the Change button in the translation view . You can add parameters to the Term Browser URL to change the appearance of the Term Browser or access specific functions. The following parameters apply to both the standard view and the translation view . ​#list=​yes Show the results filter of the default filter as soon as you open the Term Browser. By default, the Term Browser does not display the results of the default filter when you first open the Term Browser. Restriction: In the translation view , the parameter ​#list=​yes only displays the results of most recent search, or all terms if you have started a new session. ​#term​Database​Id=​​<​T​E​R​M​_​I​D​> Display the term help for a specific term, using the numeric term database ID. The term ID is normally displayed in the help information for a term. This parameter can be useful to share a link to a specific term with another user. ​#search=​​<​S​E​A​R​C​H​_​T​E​X​T​> Display the term help for a specific term, using the term name. You can also enter search text which contains a wildcard. This parameter can be useful to share a link to a search result with another user. ​?locale=​ Change the language of the Term Browser interface. The Term Browser is currently available in English and German. The following parameters apply to the standard view only. ​#hide=​filterbutton Display the Term Browser with the filter button removed from the Search and Filter Bar . This parameter is useful to share the Term Browser with users who are not familiar with the options displayed in the filter menu. Tip: Users can still open saved filters and edit filter criteria in a saved filter. ​#filtername=​​<​F​I​L​T​E​R​_​N​A​M​E​> Link directly to the results of a saved filter. Tip: Use this parameter in combination with the parameter ​#list=​yes . 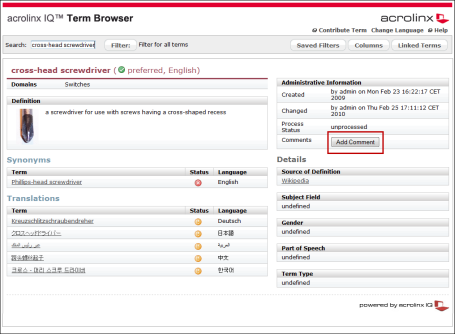 You can propose new terms for the terminology database of your organization while you are using the Term Browser. To do so, click the Contribute Term menu item in the top right of the Term Browser window. You will be directed to the term contribution page where you can submit your term contribution. Important: To use the term contribution feature you need the appropriate user privileges. (Follow this step if you are not already logged into the Add Comment page) Log on using your User ID and Password . Enter your comment in the text box which appears. (Optional) Select Request review so that your terminologist can easily find your new comment. The Request review option is available as long as the Terminology Manager is configured correctly. If the Request review option is not available, your terminologist must configure the Process Status field to include the status review requested . You might print the list of the terms in the search results table if you want to distribute the terms to users without network access. The print function is available in the standard and the translation view. Apply a filter or enter a keyword search to view a list of terms. Click Print in the search and filter bar. The Term Browser prints all displayed terms. You find the number of displayed terms in the table header of the search results table.